Not real sure what all will go in here. I cross stitch,take care of kids,I like to listen to music(not too fond of country),I like to read. I live in Texas,was born in Ohio. Miss the snow for sure. 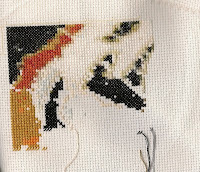 I belong to a few cross stitch groups and enjoy participating in swaps and exchanges.Doing a few SAL's which are fun because you get to see everyone's progress and the changes they might have made to the design. There's a lot of nice work out there. I have two kids out of five still in the house. They are 13 and 14 a boy and a girl. We have Valorie she's 2(no she's not mine she's my daughters child) she consumes my days.